Henshaw, Dora O., head-of-household, age 28, born in Oklahoma; father born in Tennessee; mother born in Missouri; rented home; widow; occupation: none. Henshaw, Maurice G., son, age 3 years 9 months, born in Oklahoma; father born in Kansas; mother born in Oklahoma. Henshaw, Everett D., son, age 2 years 6 months, born in Oklahoma; father born in Kansas; mother born in Oklahoma. Henshaw, Deresia M., daughter, age 1 year 5 months, born in Oklahoma; father born in Kansas; mother born in Oklahoma. Henshaw, Howard I., son, age 9 [unclear] months, born in Oklahoma; father born in Kansas; mother born in Oklahoma. Hinshaw, Dora, head-of-household, age 38, born in Oklahoma; father born in Tennessee; mother born in Missouri; widow; first married at age 19 [or 17 - unclear]; owned home ($1000 value); no radio in home; occupation: clerk, grocery. Hinshaw, Maurice, son, age 14, born in Oklahoma; father born in Kansas; mother born in Oklahoma; attended school. Hinshaw, Everet D., son, age 12, born in Oklahoma; father born in Kansas; mother born in Oklahoma; attended school. Hinshaw, Deresia M., daughter, age 11, born in Oklahoma; father born in Kansas; mother born in Oklahoma; attended school. Hinshaw, Howard J., son, age 10, born in Oklahoma; father born in Kansas; mother born in Oklahoma; attended school. 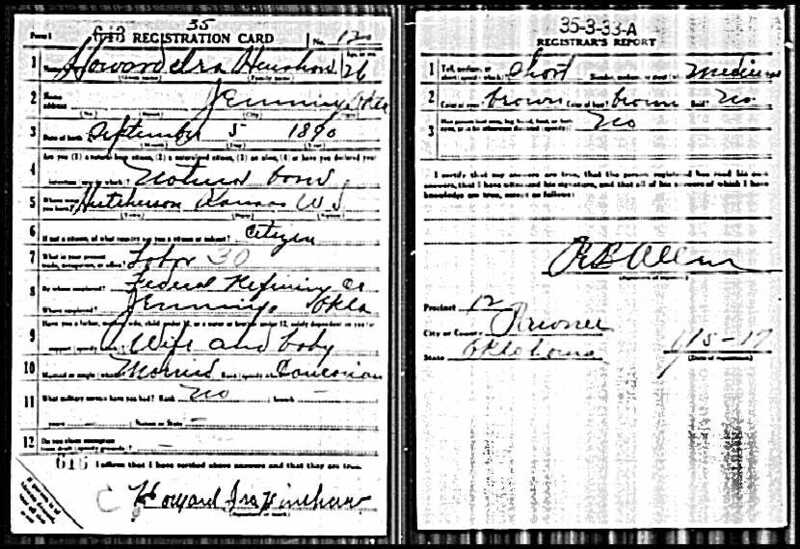 Jackson, [first name blank], head-of-household, male age 72, born in Tennessee; parents born in Tennessee; widower; first married at age 28 [or 25 - unclear]; owned home ($1500 value); no radio in home; occupation: merchant, grocery; not a veteran. Phillips, Dora, head-of-household, age 42 [unclear]; [birthplace blank]; [education blank]; on Apr 1 1935 was living in the same place/town; married; rented home ($4/month rent). Phillips, Billie Jean, daughter, age 8, born in Oklahoma; completed 1st grade; on Apr 1 1935 was living in the same place/town; attended school. Hinshaw, Junior, son, age 20, born in Oklahoma; completed 5th grade; on Apr 1 1935 was living in the same place/town; divorced; occupation: carpenter's helper, building construction; worked 16 weeks in 1939; $320 wages in 1939. 1920 census, Jennings, McElroy Township, Pawnee County, Oklahoma; roll T625-1482, ED 147, page 19B, line #66, dwelling #184, family #184. 1930 census, Jennings, Pawnee County, Oklahoma; roll T626-1924, ED 14, page 1B, line #21, dwelling #18, family #18. 1910 census, McElroy Township, Pawnee County, Oklahoma; roll T624-1268, ED 180, page 197A, line #24, family #142. Ancestry Family Tree data "Rinehart Family Tree" posted by "rinehartmark". Contribution from Earline B. Stewart (). 1920 census, Jennings, McElroy Township, Pawnee County, Oklahoma; roll T625-1482, ED 147, page 20B, line #71, dwelling #212, family #212. 1920 census, Jennings, McElroy Township, Pawnee County, Oklahoma; roll T625-1482, ED 147, page 20A, line #29, dwelling #201, family #201. 1930 census, Jennings, Pawnee County, Oklahoma; roll T626-1924, ED 14, page 1B, line #20, dwelling #17, family #17. Ancestry Family Tree data "Hinshaw Family Tree" posted by "Moses Chrisco". 1940 census, Depew, Creek County, Oklahoma; roll T627-3288, ED 19-10, page 10A, line #19, household #229.